ULSAT is a competitive entrance examination conducted by University of Petroleum and Energy Studies to invite applications for various Law programs. This is a National Level Undergraduate Examination, which is conducted every year. Qualified students will be eligible to get admissions in university and its affiliated colleges. Course 6 Years Integrated B.Tech in CSE + LLB(Hons.) with specialization in Cyber Law Course. • Applicants of 5 year integrated BA LLB(Hons) in Energy Law, BA LLB(Hons) in Corporate Law courses are required to pass their 10+2 or higher secondary or equivalent examination with aggregate marks of 50% from a recognized educational board. • Candidates applying for 6 year integrated B.Tech in Energy LLB(Hons) in Intellectual Property Rights or B.Tech CSE in LLB(Hons) in Cyber Law courses must score aggregate marks of 60% in 10+2 with mandatory subjects being Physics, Chemistry and Mathematics from a recognized educational board. • Candidates must be from India only and need to satisfy domicile requirements. 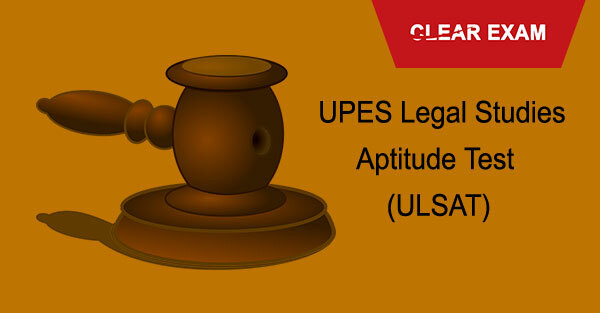 Candidates applying for ULSAT 2018 to pursue these Law courses should be above 17 years, but not exceed 23 years of age. Payment of application fee will be 1750/- if purchasing forms directly at the campus or else 1850/- has to paid through DD if sent through the post. DD should be drawn in favor of “UPES Fee Account, payable at Dehradun or Delhi”. • Application forms will be available in the university for sale or can even be sent on request through post. • Candidates are required to buy the application forms by remitting the cost of the application material in cash or demand draft. • Fill the application form with all correct details. • Send the filled in form through registered post to Office of the UPES University. Syllabus in ULSAT 2017 will cover the topics of Language Comprehension, Quantitative, Numerical Ability, Logical Reasoning, Legal General Knowledge and Legal Aptitude. All questions are in multiple choice with a total of 200 questions. Following are the important dates for ULSAT 2018 exam. • Last date for sale and receipt of application forms will be in the month of May 2018. • Dispatch of hall tickets will be in the last week of May 2018. • Date of Examination will be in the 1st week of June 2018. • Declaration of Result will be in the 3rd week of June 2018.